Back in the 90’s and early noughties, home videogaming used to be quite a solitary thing unless you had friends in the room with you to play co-op or versus with. With the advent of internet connectivity, gamers can now not only play with their friends down the road in separate houses but with people on the other side of the world! With games like Call of Duty, GTA5 Online, PUBG, Fortnite and other online multiplayer games, communicating with each other has become an important part of working with others to reach a desired in-game goal. Some people also stream their gameplay on Twitch and YouTube, providing a running commentary on the action seen on-screen. All of this couldn’t be done without the use of microphones which is why, over the years, we’ve seen the rise in popularity and use of gaming headsets. 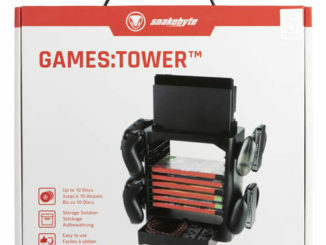 Allowing you to hear the in-game music and sound all whilst chatting to other players has become ingrained upon the gaming society, with gaming accessory companies looking to improve and develop the headsets. One such company, snakebyte, has just released their Head:Set Pro gaming headset and in this review I’ll be taking a look at just how well it performs. When it comes to style, snakebyte like to be bold. Combining black with hi-vis yellow gives a striking aesthetic to the headset and will make you stand out in the crowd. From the yellow cable to the yellow head frame and ear cup lining, the contrast works incredible well and is very visually appealing to look at. I’m the sort of person who likes things to be a bit different or to stand out, as long as it’s tasteful, and these certainly do. The headset has a leather-effect headband that stretches to the size of your head from its anchor points, to fit the different sized heads of gamers. I much prefer this style of fit than to others I’ve had in the past that rely on a ratchet type system. The headband itself is soft and comfortable, much like the cushioned ear pads that sit over your ears. The thick cushioning of the earpads feels so light that it doesn’t emit a feeling of compression against the ears. Even after wearing the headset for a few hours in a single sitting, my ears are comfortable. 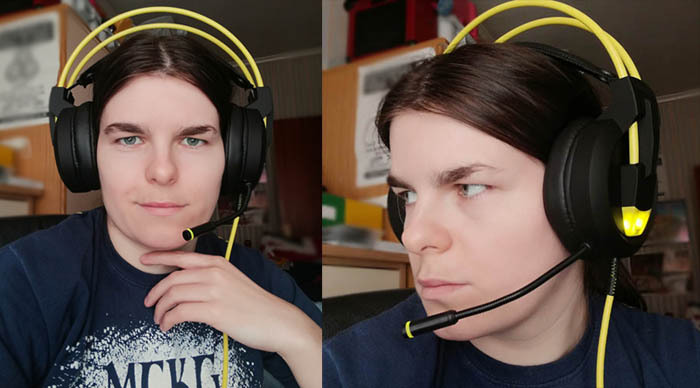 The yellow frame that sits above the headband is a bit higher than my previous headsets and because of this, and the fact I have a shallower head than some, the headset can look a little oversized to onlookers. This is only noticeable by people observing you and has no effect on the actual feel of the headset when being worn. The microphone stalk is attached to the left ear cup and is quite neat in its structure. It can be bent and positioned however you prefer with 120 degrees of movement. The end of the microphone stalk has a light ring around it which lights up yellow when the microphone is activated. 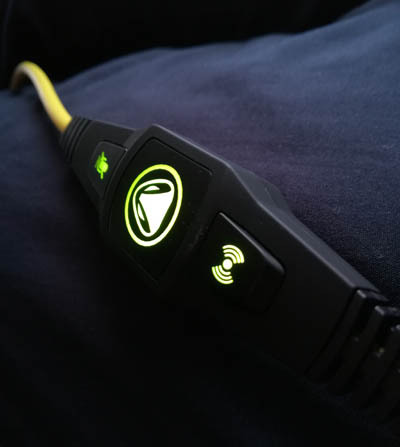 With the headset connecting to the computer by USB rather than separate audio and microphone inputs, you have the ability to mute the microphone at any given time using a selector partway down the headset cable. When the microphone is activated, the selector lights up yellow as does the end of the mic. The selector also has a volume wheel, so you can easily alter the volume at any point, as well as a bass boost button. Sometimes it’s hard to notice the difference between boosted bass and non, but this video is a really good test for this and there’s a noticeable difference between bass boost being activated on the headset and it being deactivated. With the USB powering the headphones, lights at the base of each of the ear cups light up to produce a stylish looking headset. The light of the selector, mic and ear cups compliment the headset without making it look like a glowing bulb. There’s just enough to highlight the details without it looking over the top. I’ve used and reviewed a few different headsets over the years and this might be my favourite so far. It feels premium, from the materials used right down to the detail. 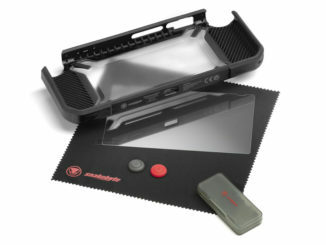 The fact it also comes with a 5 year warranty and is the product of German design and development also gives me great comfort in a product that seems to be reliable and fit for purpose. No part of the headset feels cheap or flimsy. It feels like every part of the headset has had thought put into it to produce something of comfort and practicality. The microphone quality is often a sticking point in headsets as the mic needs to provide quality audio in order for other players to hear you properly and for game recordings or streams to not sound crackly, noisy or of sub-par quality. The snakebyte Head:Set Pro has an incredible microphone for a headset, with crisp, clear audio that works right out of the box. I was impressed that I could be heard clearly without having to make any adjustments on my PC, as in the past, with previous headsets, I’ve had to adjust settings and even then not got as clear audio as the snakebyte captures. Granted, it’s never going to match up against a dedicated mic like the Blue Snowball, but as far as a headset mic goes, I’ve yet to use one better! As you can hear in the below video, there’s no compressed, interfered sound. The vocals are clean cut, with no outside noise interference; just what you want when recording and speaking to others during gameplay. When playing a videogame properly, you want to be immersed in the gameplay and story. A headset can bring you into the game through its sound delivered straight to your ears rather than the tiny monitor speakers output which usually doesn’t quite hit home, with outside noises interfering. With a good headset, there’s hardly anything getting in the way of you and the game. Having excelled in quality of build and microphone, the snakebyte Head:Set Pro rounds off its headphones by featuring 7.1 virtual surround sound with 50mm audio drivers. It’s jaw-dropping to say the least and gives added depth to your gameplay, especially in a game such as GTA 5 and Dolby Atmos compatible games. The padded ear cups are also effective at passive noise cancellation, hearing very little outside noise once I’m wearing and listening to audio through the headset. It’s like you’ve been transported somewhere else when wearing them and the level of absolute quality and performance that snakebyte has achieved with these is breathtaking. snakebyte have truly outdone themselves with these headphones with a microphone that exceeds expectations and audio that transports you to another place. Its slick design, LED detail and handy volume/setting selector on the USB cable shows how much the brand is in-tune with modern gamers. The comfort level that the headset also provides is worth noting too, as most gamers, like myself, will find themselves using headsets for a long period of time. Priced at an exceptionally reasonable cost of around £35-£40, the snakebyte Head:Set Pro is an absolute outstanding piece of kit for the money, one that could easily be priced higher, such is the premium creation and design of the product. For gamers who are looking for a headset but don’t want to break the bank, this headset is a must.